When dressers work well, they are an invaluable storage item, but they can become less useful if a stuck dresser drawer hinders you from accessing your items. Removing your dresser drawers is important if you are moving, if you have lost something behind the dresser drawers or if you want to refinish the dresser. Whether you have a renovation project to tackle or just want to retrieve your clothing without hassle, there are a few steps you can follow to get a dresser drawer out. Only fill the drawers of a dresser to capacity. Open the dresser drawer as much as you can. Reach inside and then up to touch the interior opening of the dresser where the drawer sits. 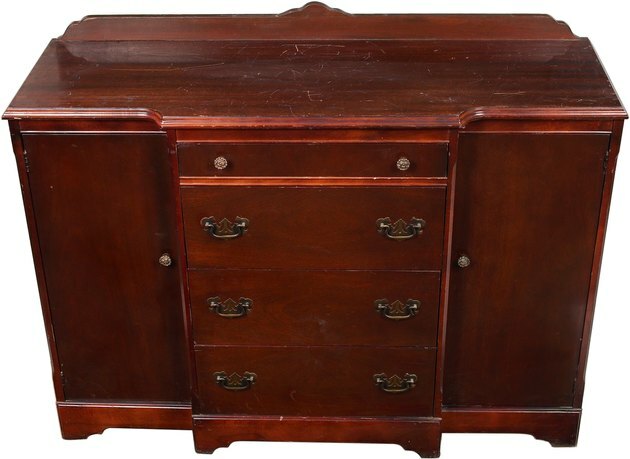 Some dressers have latches that need to be pushed or spun that prevent the drawer from sliding out all the way. If you have such a latch, move it to allow the drawer to come out. Remove everything from the dresser drawer and the drawers above and below it. Sometimes the weight of the items in the drawers bows the dresser itself and prevents easy removal. Slide the drawer out gently, giving it a gentle yank when it is at full extension. Some drawers will slide out with no need for an extra yank at all, while others need slightly more force to get over the wheels over the edge of the runners.